“Have you heard that expression [prime the pump] used before? Because I haven’t heard it. I mean, I just…I came up with it a couple of days ago and I thought it was good.” – Donald John Trump to The Economist, claiming to have invented an eight decade old phrase. 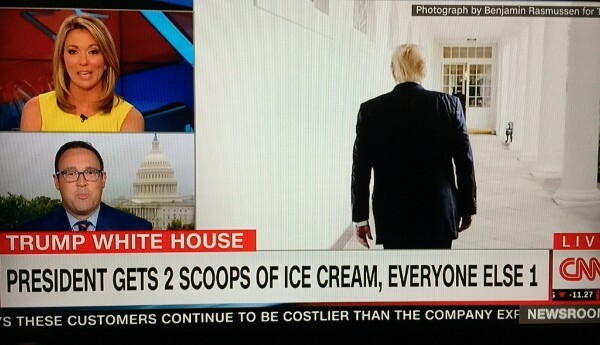 Trump went from 0 to Watergate in record time. Let’s take it through a good ol’ day-by-day TrumpShakedown. The President of the United States fires the FBI Director who is investigating the President’s associates for involvement with a foreign power. The official White House statement notes that the President relied on the recommendations of the Deputy Attorney General (who oversees the FBI Director) and the Attorney General (who had recused himself from the Russian interference investigation, but apparently not from firing the person overseeing the investigation). The statement also notes that Trump was shocked, shocked(!) by how poorly Hillary was treated by Comey. That, combined with Comey losing the faith of the rank and file agents, means he has to go. Trump sends his personal bodyguard to deliver the termination letter to Comey at FBI headquarters. The letter didn’t make it to Comey, though, since he was in LA at a FBI recruiting event. Not sure which is more troubling — sending muscle to fire someone or that the President is not competent enough to know that the FBI director is nearly 3,000 miles away. Comey learns about his firing from a TV report. At first, he thinks it’s a joke, but then he realizes that the FBI is advertising has one more job opening than before he kicked off the recruiting event. In the break-up letter, Trump tells Comey, “I greatly appreciate you informing me, on three separate occasions, that I am not under investigation.” If this had occurred, it would have been extremely inappropriate for Trump to ask if he was under investigation and for Comey to answer that question. The backlash is immediate. Trump’s team is totally unprepared. They thought the Democrats would be happy Comey was fired, apparently unfamiliar that someone could not like another person but not think it is worth destroying democracy to get even with them. Trump works his bipartisan magic by lashing out at “Cryin’ Chuck Schumer”. In case you forgot, Trump gave Schumer that moniker after Schumer got teary talking about Trump’s Syrian refugee ban since most of Schumer’s family was killed in the Holocaust. The only outlet not bashing Trump is Fox News. Fox originally reports that Comey resigned and Hannity excitedly asks if this means that the FBI will finally go after Hillary. Trump spends the day after firing the person investigating his Russian ties . 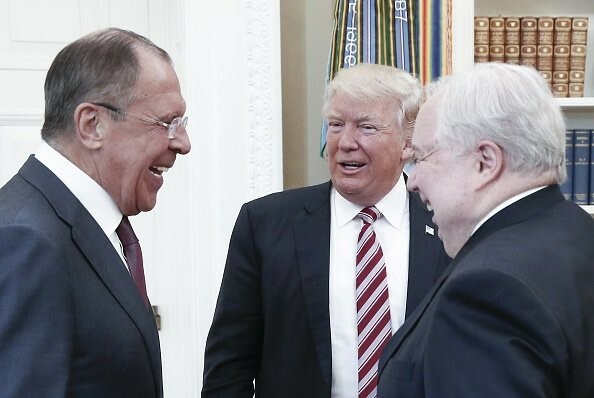 . . meeting with the Russians in the Oval Office . . . at Putin’s request! This isn’t even B-level movie material. Spicer is sent to Siberia and Sarah Huckabee Sanders (yep, former Arkansas Governor and current full time crackpot Mike Huckabee’s daughter) gets to handle the press briefing. She pokes the first hole in the dam of BS holding back the real story on Comey’s firing, letting everyone know that Trump had been contemplating firing Comey for a while and had a meeting on Monday with Sessions and Rosenstein, asking them to put their recommendations in writing. Pence makes the rounds saying that Comey is fired because he wasn’t doing a good job. Rumors start to fly that Rosenstein is really put out about being the fall guy on the firing. 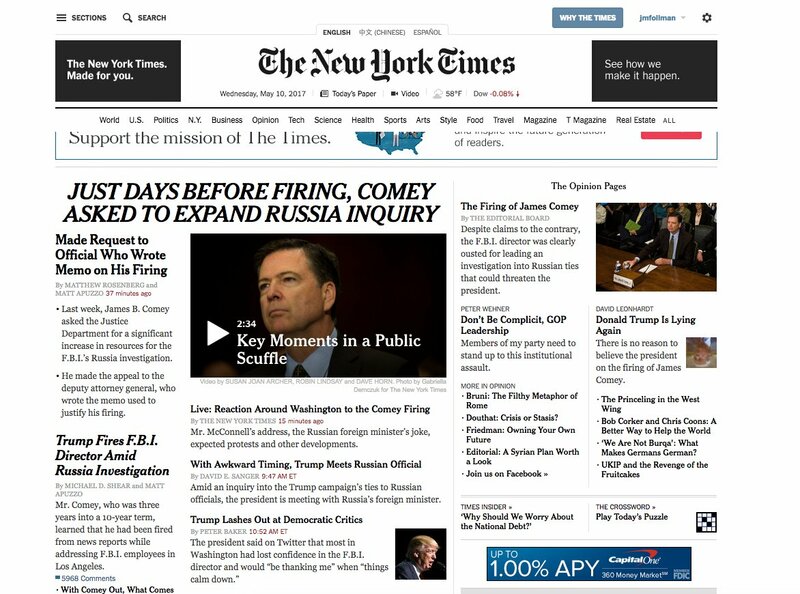 The New York Times reports that days before his firing Comey had asked for more resources for the Russia investigation. Trump supporters immediately fall in line. In April, 31% of GOP voters said they supported removing Comey. On Wednesday, 62% say they support his firing. The Washington Post issues a retraction that Spicer was not hiding in the bushes but rather “among bushes.” America is saved! Trump administration officials are furious the Russian media released photos of Russian officials marking their territory in the Oval Office. CNN quotes one angry White House official, “They tricked us. That’s the problem with the Russians – they lie.” If only they had 70 years of warnings that Russia may not have the best interests of the U.S. in mind. Somewhere Teddy KGB is smiling for finally getting revenge against a New Yorker. Acting FBI Director Andrew McCabe, before the Senate Intelligence Committee, directly contradicts the White House’s statement that Comey had lost the rank and file FBI agents. FBI officers began changing their Facebook profile pictures to James Comey, something that is traditionally done after an agent is killed in the line of duty. Multiple reports come out that Comey never told Trump he wasn’t under investigation and that in January Trump had asked Comey to pledge loyalty to him. Comey passed on kissing the ring. Trump tweets, “James Comey better hope that there are no ‘tapes’ of our conversations before he starts leaking to the press!” First off, I think Trump may accidently be using quotes correctly for the first time. The recordings would not be on actual cassette tapes. Way to go, Pres! Second, did Trump just admit to secretly recording conversations?!? Comey associates scoff at the threat of tapes and say bring it on. Spicer returns from exile to the media room and does not deny that Trump records conversations. Earlier that morning, Trump threatens to end the daily press briefings all together. FBI raids the office of a Republican campaign consulting firm in Annapolis. On Monday, former acting Attorney General Sally Yates testified before the Senate Judiciary subcommittee on Russian interference in the election, specifically the role of “very good person” Mike Flynn. Opening for Yates’s command performance was former Director of National Intelligence James Clapper. Trump fired Yates in January after she refused to defend his travel “that by any other name would still smell like a Muslim ban” ban. On January 26, days before that principled stance, Yates notified Trump that National Security Adviser Michael Flynn was “compromised” and could be subject to Russian blackmail since he had lied about his conversations with the Russians to date. Yates’s warning on Flynn was on top of a warning from President Obama to Trump on Flynn that occurred less than two days after the November election. A Trump administration official said that Obama’s warning seemed like it was made in jest. Because, of course, I mean what’s funnier than talking treason between one President to another? Yates’s did have enough time in her testimony to establish that she had notified the Trump administration 18 days before Flynn was asked to resign, which even then only occurred after The Washington Post reported that Flynn had lied about his Russian conversations. In case the number 18 rings a bell, that’s because the same number of minutes were missing from Nixon’s tapes. The day after her testimony, the Senate Intelligence Committee issued a subpoena of General Michael Flynn for documents relevant to the Committee’s investigation into Russian interference with the 2016 elections. Flynn had previously denied to provide those docs. Is Pathological Lying a Pre-existing Condition? I know it seems like weeks ago, but when we last left Paul Ryan, he was pounding Bud Lights with the boys ofZeta Chi on the White House lawn celebrating taking health care away from millions. Since only 21% support the House Republican health plan, the Republicans are going with the “if you can’t beat ‘em, lie to ‘em,” strategy. Ryan is out front pushing the story that no one can be denied coverage under their plan. That is technically true, but the insurance company can charge whatever they want, so a cancer patient can get coverage just like you can buy a private island. While Ryan was spinning that on ABC, Secretary of Health and Human Services Dr. Tom Price told Jake Tapper on CNN that cutting $880 million from Medicaid will make Medicaid better. At his town hall, Congressman Raúl Labrador (R-ID) recycled the Romney talking point that no one dies because they don’t have health care since they can just wheel their diseased body in the ER. The other tactic has been to introduce the health care version of Reagan’s “Welfare Queen”. In the Republican worldview, there are preexisting conditions that are worthy of coverage and others that are not. Trump administration budget director, Mick Mulvaney, said this week that caring for Jimmy Kimmel’s baby is one thing, but “That doesn’t mean we should take care of the person who sits at home, eats poorly and gets diabetes.” Yes, I’m using all my willpower to resist saying something snarky right here, but you go ahead and think it, it doesn’t make you a (really) bad person. At least Mulvaney is better than some of his fellow party members, like Newt Gingrich, who have been attacking Jimmy Kimmel for daring to say that babies should have health coverage. The health care bill is now in the hands of the Senate, where the GOP is rewriting it in a private working group. The Republicans are not planning to send the bill through the usual committee and mark-up process. In contrast, during the Affordable Care Act passage, the Senate Health Committee had 14 roundtables and 13 public hearings and the Senate Finance Committee held 17 pubic roundtables and hearings in total. Obama this week to Congress: Recognize it takes little courage to aid those who are already powerful, already comfortable, already influential — but it takes some courage to champion the vulnerable and the sick and the infirm, those who often have no access to the corridors of power. Trump showing this week he has no idea how much health insurance costs or how it works: [Health] Insurance is, you’re 20 years old, you just graduated from college, and you start paying $15 a month for the rest of your life and by the time you’re 70, and you really need it, you’re still paying the same amount and that’s really insurance. No, that’s not a methaphor. Although . . . it is. Lawyers Guns and Money – The little angel on Senator Lindsey Graham’s (R-SC) shoulder was speaking a tad bit louder this week than the devil on the other shoulder, so he said he wanted to investigate Trump’s Russian financial ties. In response, Trump lawyered up. Trump called his old buddies at Morgan, Lewis & Bockius. You may remember them from that oh so impressive press conference back in January (which seems like a decade ago) at which they tried to prove Trump’s separation from his business by displaying stacks of manila folders filled with blank pieces of paper. Oh, also, if you haven’t read whatever the legal equivalent of Variety is, you may have missed that Morgan Lewis was named the Russia Law Firm of the Year in 2016. Yep, seriously. Morgan Lewis produced a letter (Trump and Spicer both very proudly declared it a “certified letter” – you can have your own certified letter for $3.35 at the post office) that said that his tax returns from the past 10 years did not show any Russian entanglements “with a few exceptions.” The exceptions the attorneys noted totaled over $100 million. You know, couch cushion money. Ignoring the letter only covered the past 10 years (Hillary provided 40 years of returns), there are as many holes in the lawyers’ statement as there are Trump and Russian oligarch shell corporations. We’d know more if Trump actually released the returns. Blinded Without Science – This week the Trump administration took a break from fighting the Civil War again and focused on undoing the Scientific Revolution. EPA administrator Scott “Mr. Heat Miser” Pruitt did not renew the terms of half of the scientists from the EPA’s Board of Scientific Counselors. He’s open to replacing the scientists with representatives from the very polluters the EPA regulates. Pruitt is not alone in the Grand Old Know-Nothing Party. Trump is rumored to be picking a non-scientist and climate skeptic, Sam Clovis, to be the top scientist for the USDA.. Just in case you were worried that Trump hadn’t found a way to work Russian ties into the Department of Agriculture, Clovis introduced Trump to Carter Page, who was voted “Most Likely to be a Russian Spy” at the Trump campaign reunion. Like a Racist David Copperfield – While the Trump administration was defending the Muslim ban in front of 13 judges in the 4th Circuit Court of Appeals, all the references to a Muslim ban on Trump’s campaign websitedisappeared. Help Me Help You – Remember last week when I mentioned that Trump said he backed down from pulling the U.S. out of NAFTA because Canada and Mexico said pretty please? Well, he was sort of telling the truth. It turns out that Trump’s own White House aides called Prime Minister Justin Trudeau and asked him to call Trump and ask him not to rip up NAFTA. We needed to enlist the help of another country to talk our President out of destroying our country. It’s like having a celebrity with a monster ego who is detached from reality running our government. Oh wait, that’s exactly what it is. Show Me Less Money – Yep, that’s back-to-back Jerry Maguire references. Don’t let it be said I don’t have my finger on the pulse of pop culture. In the latest example that the GOP belief in local control is just a branding exercise, the Republican supermajority in the Missouri legislature passed a bill banning local minimum wages. This would undo a $10 minimum wage in St. Louis that just took effect, reducing it down to $7.70. The Republican reasoning was that it would be too darn confusing for those big businesses to figure out different pay rates in different cities. I think McDonald’s Corp has more resources to solve that conundrum than the McDonald’s fry cook has to figure out how to live on 23% less (and with her health care soon to be taken away). Up Next: Fake News at 11 – Sinclair Broadcast won the bidding contest to buy Tribune Media, which includes 42 TV stations in major markets such as Chicago, New York, and Los Angeles. Sinclair, which already owns 173 stations, has a reputation for trying to be your Fox News next door. Sinclair gained national attention during the presidential campaign when Jared Kushner mentioned he made arrangements to get Trump favorable coverage on Sinclair stations. Stop the Vote – 2016 was the first presidential election after the Supreme Court burned the Voting Rights Act and from its ashes rose a raft of voter suppression laws. The results from these efforts to make it harder for poor people to vote are in. “[I]n states where the voter identification laws did not change between ’12 and ’16, turnout was up +1.3%. In states where ID laws [became more] strict turnout actually decreased by – 1.7%. Ari Berman writes in The Nation that the Wisconsin voter ID law suppressed 200,000 votes and Trump won by only 22,748. To address this disenfranchisement of hundreds of thousands, Trump created a new “Presidential Commission on Election Integrity.” Just kidding, he did it to try to figure out how to suppress more votes and to find those 3 million fake votes that gave Hillary the popular vote win. VP Pence will be the chair and Kansas Secretary of State Kris Kobach is the vice chair. Kobach has dedicated his life to making the lives of people of color difficult. He designed Arizona’s “papers, please” law, tried to implement a proof-of-citizenship requirement to vote in Kansas, and threw out thousands of uncounted votes last election. Authoritarian rule #1: It’s easier to stay in power if the opposition can’t vote. Count Me Out – The U.S. Census Director, John Thompson abruptly resigned this week. He did not state a clear reason for his resignation, but rumor has it (and you know how catty those census people are) that it was due to concerns with lack of funding for the 2020 census. You may be thinking, “Why should I care about this when Trump is seizing power, millions may lose health care, and the host of Dance Moms is going to jail?” The outcome of the census determines representation in Congress and federal funding for programs. Decreasing funds makes it harder to reach certain groups (e.g., poor people, homeless people, non-English speakers), likely resulting in insufficient program funding and representation for them. Alternatively, if you’re a glass is half-full of Trump Kool-Aid sort of person, a census that shows less poor and homeless people means you’ve fixed their problems! They Were Saying Boo-vos, Boo-vos – At the Bethune-Cookman University graduation, students booed and turned their backs on commencement speaker, Secretary of Education Betsy DeVos. Bethune-Cookman is a historically black college, a group of schools that DeVos once congratulated for being “pioneers of school choice.” Well, Secretary, the graduates didn’t choo-choo-choose to hear you speak. You’ve Got the Cutest Little Baby Jail – Texas, in its bid to become its most Texas version of itself, approved a bill written by a private prison corporation. The bill allows immigrant family detention centers aka “baby jails” to be classified as child care facilities without all those annoying regulations that actual child care facilities have to abide by so that they aren’t . . . baby jails. Rest assured though, the sponsor of the bill, State Senator Bryan Hughes has “seen pictures” of these facilities before. The Navy is now scrambling to come up with a response to this non-sensical and untrue story. You know what’s interesting, I’m getting very good marks in foreign policy. People would not think of me in that light. I’m just saying, and you read the same things I read. I’m getting As and A+s on foreign policy. And nobody thought about it. The American fascists are most easily recognized by their deliberate perversion of truth and fact. Their newspapers and propaganda carefully cultivate every fissure of disunity, every crack in the common front against fascism. They use every opportunity to impugn democracy . . . They claim to be super-patriots, but they would destroy every liberty guaranteed by the Constitution. They demand free enterprise, but are the spokesmen for monopoly and vested interest. Their final objective toward which all their deceit is directed is to capture political power so that, using the power of the state and the power of the market simultaneously, they may keep the common man in eternal subjection. New analysis lays waste to theory that it was economic uncertainty that powered Trump to victory, rather than xenophobia and racism. “It was cultural anxiety that drove white, working-class voters to Trump” in The Atlantic. Trump ordered Secretary of the Interior Ryan Zinke to review 27 National Monuments designated by past presidents over the last 21 years. He’s trying to find a way to pave monuments and put up a drilling spot. Modern Hiker provides a how to on making your voice heard during this review process. We at The TrumpShaker believe that constant vigilance is necessary to ensure that the election of President Trump does not lead to an America under authoritarian rule. We designed this weekly newsletter to provide a quick way to keep up to date and to feature opportunities to take action. We will do our best to provide accurate and somewhat timely information. We are not journalists. However, our Editor was the Sports Editor of his high school paper and also did a nightly radio update in college on what the cafeteria was serving, so that’s more direct experience for this job than Donald Trump has for his current one.